Zhang Yue, founder and chairman of Broad Sustainable Building, is not a particularly humble man. A humble man would not have erected, on his firm’s corporate campus in the Chinese province of Hunan, a classical palace and a 130-foot replica of an Egyptian pyramid. A humble man, for that matter, would not have redirected Broad from its core business—manufacturing industrial air-conditioning units—to invent a new method of building skyscrapers. And a humble man certainly wouldn’t be putting up those skyscrapers at a pace never achieved in history. 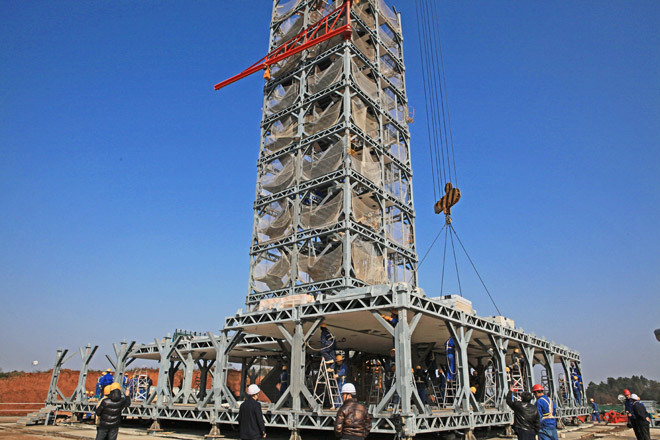 In late 2011, Broad built a 30-story building in 15 days; now it intends to use similar methods to erect the world’s tallest building in just seven months. Perhaps you’re already familiar with Zhang’s handiwork: On New Year’s Day 2012, Broad released a time-lapse video of its 30-story achievement that quickly went viral: construction workers buzzing around like gnats while a clock in the corner of the screen marks the time. In just 360 hours, a 328-foot-tall tower called the T30 rises from an empty site to overlook Hunan’s Xiang River. At the end of the video, the camera spirals around the building overhead as the Broad logo appears on the screen: a lowercase b that wraps around itself in an imitation of the @ symbol. The pace of Broad Sustainable Building’s development is driven entirely by this one man. Broad Town, the sprawling headquarters, is completely Zhang’s creation. Employees call him not “the chairman” or “our chairman” but “my chairman.” To become an employee of Broad, you must recite a life manual penned by Zhang, guidelines that include tips on saving energy, brushing your teeth, and having children. All prospective employees must be able, over a two-day period, to run 7.5 miles. You can eat for free at Broad Town cafeterias unless someone catches you wasting food, at which point you’re not merely fined but publicly shamed. Broad employees (here lining up for a morning briefing) have to memorize the chairman’s advice on everything from brushing teeth to having kids. So far, Broad has built 16 structures in China, plus another in Cancun. They are fabricated in sections at two factories in Hunan, roughly an hour’s drive from Broad Town. 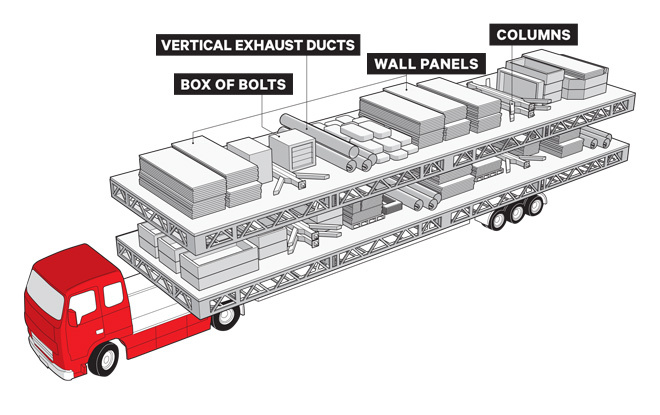 From there the modules—complete with preinstalled ducts and plumbing for electricity, water, and other infrastructure—are shipped to the site and assembled like Legos. The company is in the process of franchising this technology to partners in India, Brazil, and Russia. What it’s selling is the world’s first standardized skyscraper, and with it, Zhang aims to turn Broad into the McDonald’s of the sustainable building industry. Pipes and ducts are threaded through each floor module while it’s still in the factory. The client’s choice of flooring is also preinstalled on top. 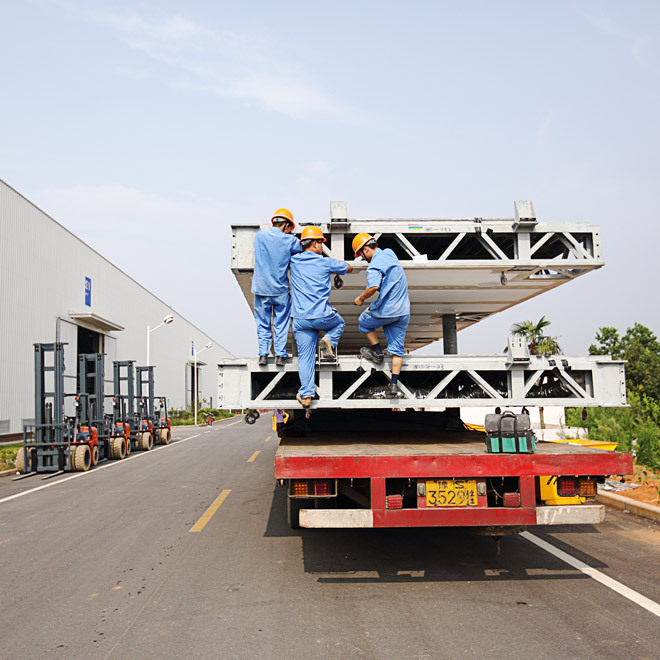 Workers load modules onto trucks. Broad’s design has aced 9.0-magnitude earthquake tests. 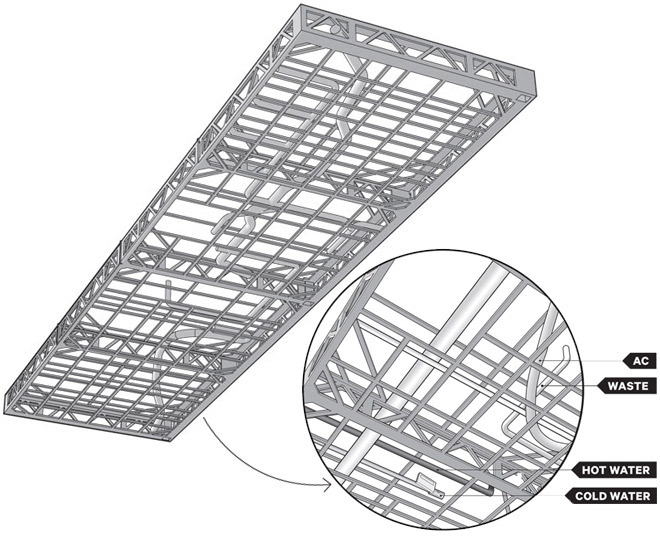 The reason: this unique column design, with diagonal bracing at each end and tabs that bolt into the floors above and below. Asked about his life story, Zhang avers that it’s too boring to discuss. (“This whole article shouldn’t be more than two pages,” he says.) But he goes on to attribute his success to his creativity and to his outsider perspective on technology. He started out as an art student in the 1980s, but in 1988, with the help of two partners, including his brother (an engineer by training), Zhang left the art world to found Broad. The company started out as a maker of nonpressurized boilers. While Zhang again insists that the story isn’t interesting enough to talk about, Broad’s senior vice president, a smiley woman named Juliet Jiang who sports a bowl haircut just too long to stay out of her eyes, is happy to fill in the gaps. “He made his fortune on boilers,” she says. “He could have kept doing this business, but my chairman, he saw the need for nonelectric air-conditioning.” China’s economy was expanding past the capacity of the nation’s electricity grid, she explains. Power shortages were a problem. Industrial air-conditioning units fueled by natural gas could help companies ease their electricity load, reduce costs, and enjoy more reliable climate control in the bargain. For two decades, Zhang’s AC business boomed. But a couple of events conspired to change his course. The first was that Zhang became an environmentalist, a gradual awakening that he says began 10 or 12 years ago. The second was the 7.9-magnitude earthquake that hit China’s Sichuan Province in 2008, causing the collapse of poorly constructed buildings and killing some 87,000 people. 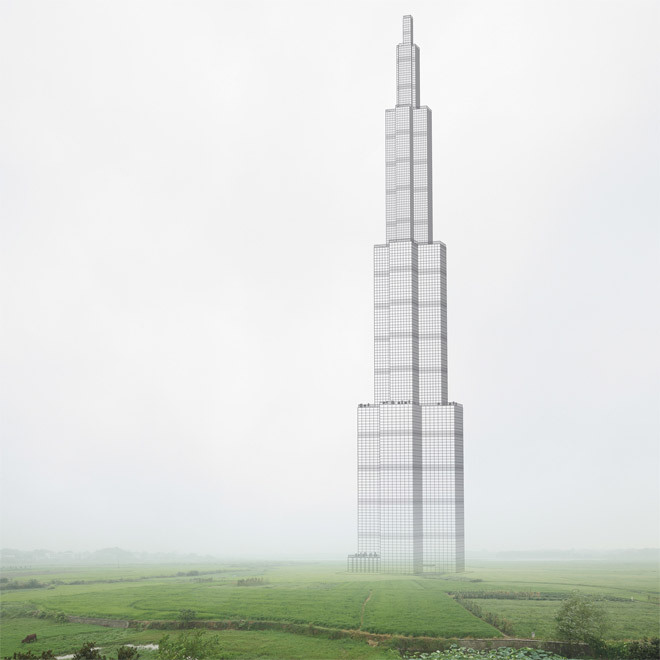 In the aftermath, Zhang began to fixate on the problem of building design. At first, he says, he tried to convince developers to retrofit existing buildings to make them both more stable and more sustainable. “People paid no attention at all,” he says. 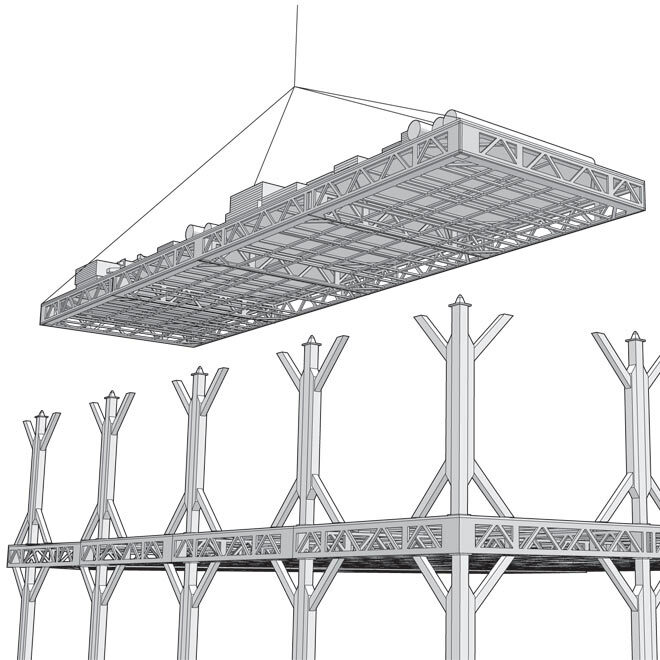 So Zhang drafted his own engineers—300 of them, according to Jiang—and started researching how to build cheap, environmentally friendly structures that could also withstand an earthquake. These theories are increasingly accepted by the sustainable building community in the West, where prefabricated and modular buildings are gaining in popularity. In New York, a 32-story modular building, the world’s tallest of its kind, is slated to go up near the Barclays Center arena in Brooklyn (though union disputes might result in a more traditional building instead). Two entirely modular developments have gone up in the suburbs of London. Both modular buildings (which are delivered to a site in prebuilt cubes) and prefabricated towers (closer to what Broad is doing) are safer to construct and easier to regulate than traditional structures, and both cut down on waste. But modular and prefabricated buildings in the West are, for the most part, low-rise. 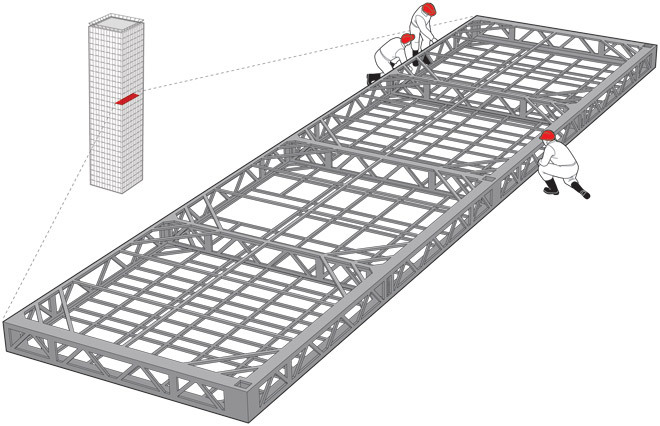 Broad is alone—perhaps forebodingly alone—in applying these methods to skyscrapers. For Zhang, the environmental savings alone justify the effort. According to Broad’s numbers, a traditional high-rise will produce about 3,000 tons of construction waste, while a Broad building will produce only 25 tons. Traditional buildings also require 5,000 tons of water onsite to build, while Broad buildings use none. 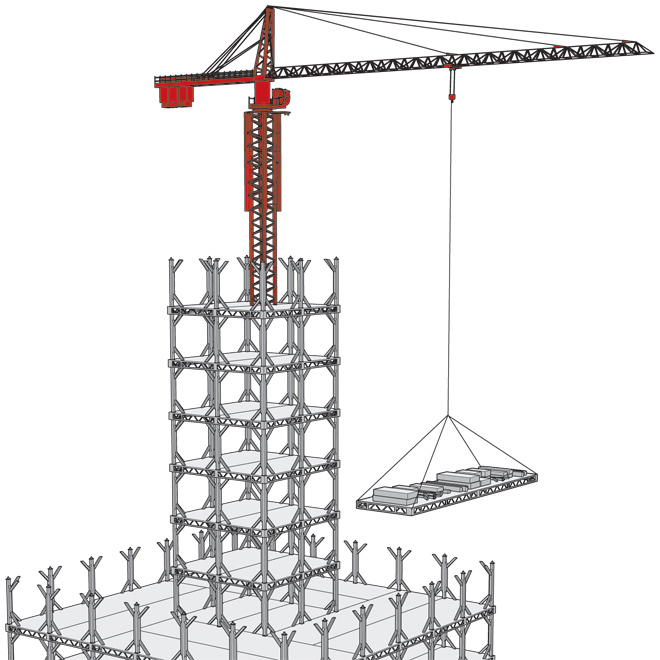 Prefabricated skyscrapers can be inflexible. To create a lobby for this hotel, Broad had to stick an awkward pyramid onto the base. Compared with the West’s elegant modular buildings, Zhang’s skyscrapers are aesthetically underwhelming, to say the least. On a tour of the T30, my guide gestures at a scale model and says, “It’s not very good-looking, is it?” To create a sufficiently spacious lobby for the hotel, an awkward pyramid-shaped structure had to be attached to the base. Inside, the hallways are uncomfortably narrow; climbing the central stairway feels like clanging up the stairs of a stadium bleacher. It’s worth noting, though, that the majority of apartment buildings going up in China are equally ugly. Broad’s biggest selling point, amazingly enough, is in the quality. In a nation where construction standards vary widely, and where builders often use cheap and unreliable concrete, Broad’s method offers a rare sort of consistency. Its materials are uniform and dependable. There’s little opportunity for the construction workers to cut corners, since doing so would leave stray pieces, like when you bungle your Ikea desk. 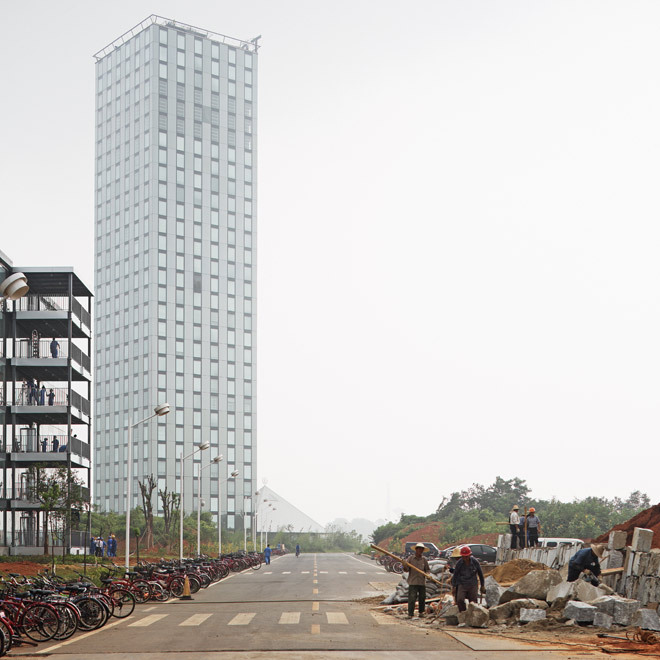 And with Broad’s approach, consistency can be had on the cheap: The T30 cost just $1,000 per square meter to build, compared with around $1,400 for traditional commercial high-rise construction in China. The building process is also safer. 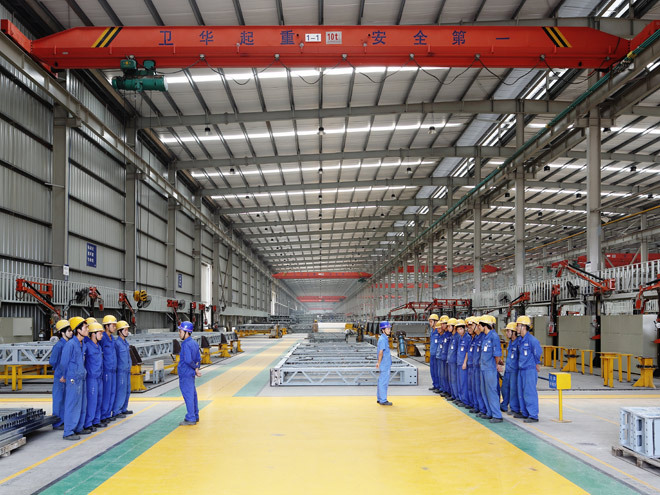 Jiang tells me that during the construction of the first 20 Broad buildings, “not even one fingernail was hurt.” Elevator systems—the base, rails, and machine room—can be installed at the factory, eliminating the risk of a technician falling down a 30-story elevator shaft. And instead of shipping an elevator car to the site in pieces, Broad orders a finished car and drops it into the shaft by crane. In the future, elevator manufacturers are hoping to preinstall the doors, completely eliminating any chance that a worker might fall. Lauren Hilgers (lauren.hilgers) was based in Shanghai as a reporter from 2007 to July 2012.